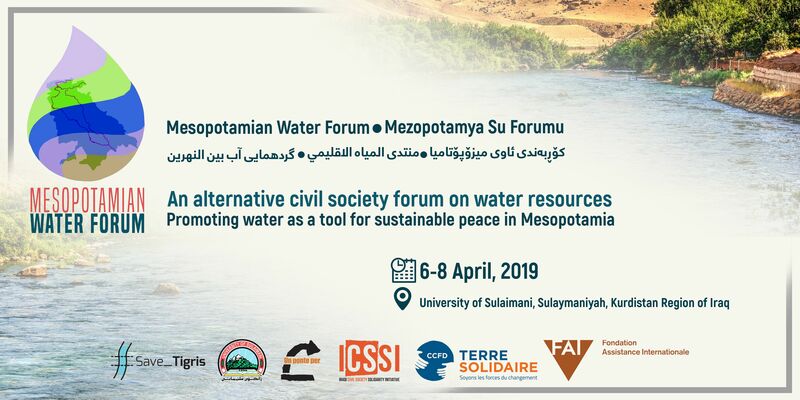 The 1st Mesopotamian Water Forum was held on April 6-8, 2019 in Sulaimani (Sulaymaniyah) in the Kurdistan Region of Iraq. More than 180 water activists from the Mesopotamia region and other countries gathered for the 3-day forum at Sulaimani University. The Forum will provide a space for open and public dialogue about the status and access of bodies of water in the Mesopotamian region, with particular emphasis on the issue of water rights in the Mesopotamian context. The Forum proposes a framework for a water policy which is based on participation, sustainability and other social and ecological principles. We want to foster public debate and encourage broad involvement in initiatives that might be implemented to transform water into an instrument for solidarity and peace, making it a model for the just and fair sharing of resources. We reject the use of water as a tool for oppression, used to entrench inequitable power dynamics that perpetuate ongoing conflicts. This event will be an important opportunity to promote a society-wide coalition for transboundary water cooperation that includes all relevant actors in the region. Civil society organizations, activists, researchers, academics, journalists, local community representatives and local authorities who share our values and are involved in the struggle for sustainable and participatory water management methods, who support our conviction that water is a tool for solidarity and sustainable peace, are invited to take part in the discussions and actions of this Forum. At least 100 participants from the region and beyond will take part in the 3 days of activities. A. Lack of democratic decision-making processes and water-sharing management at local and regional levels and the privatization of water resources and water infrastructure, which hinder access to water. B. 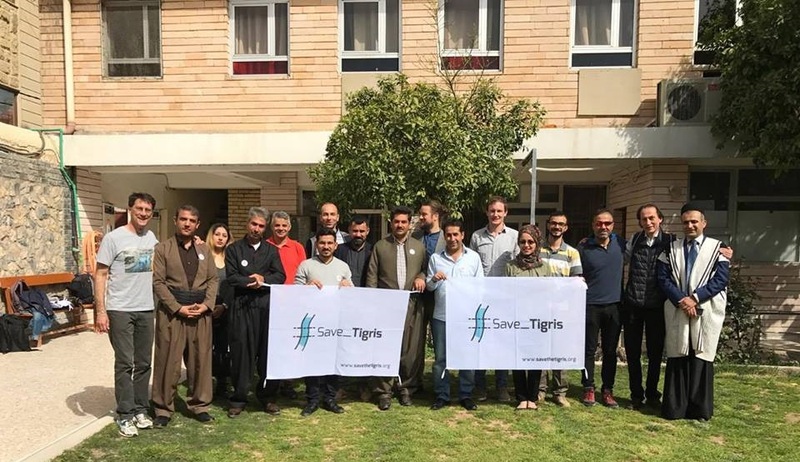 Construction of large dams and other water infrastructure on the Tigris and Euphrates Rivers and their tributaries which respect neither the rights of people, nor international standards, hereby threatening the cultural and natural heritage of the Tigris-Euphrates Basin. This is exacerbated by the use of water infrastructure as weapon and a tool for achieving political hegemony in regional conflicts. C. Destruction of the rivers’ ecosystem, including water pollution, unsustainable management of water resources and impact of global climate change. A. To share and use water resources respecting the principles of equity, effectiveness, participative decision-making, sustainability and accountability. B. To ensure that watercourses are tools for sustainable peace among all communities in Mesopotamia. C. To promote sustainable management of our rivers, their ecosystems, biodiversity and our cultural and natural heritage. How can we address the water challenges of the region? We identified 3 main water challenges in the region. To kickstart the discussions during the plenary sessions of the Forum, we published 3 papers on these topics in advance of the event. They include views from different geographical locations and expertise. Water and democracy: Can local communities influence water management in the Tigris-Euphrates River Basins? This paper outlines some of the mechanisms by which relevant actors (including activists, civil society organizations, social movements, local communities, academics/researchers, municipalities, and regional administrations) can cooperate with governments, large corporations and small/medium-size enterprises (SMEs) to achieve sustainable approaches to water sharing. Some of these methods are cooperative, others oppositional. Notes on the Author: John Crofoot is an independent researcher and writer focusing on business strategy, heritage conservation and uses of public space for recreation. He is the co-founder of Hasankeyf Matters and has lived in Hasankeyf, Turkey, for 4 years. This paper gives a framework for the analysis of the ecological, social and cultural impacts of dams and other water infrastructure and its political implications for the Mesopotamia Region. it discusses alternatives based on acknowledging rights of people living int he whole basin, as well as the impact on wildlife. Notes on the Author: Ercan Ayboga has worked in the provincial administration of Diyarbakir (Amed), Turkey where has coordinating the Tigris River Project in the World Heritage Site Management of the urban area.He is the international coordinator of the Mesopotamian Ecology Movement and is an leading activist of Initiative to Keep Hasankeyf Alive. – What are the drivers behind “water nationalism”? Where can water rights activists look for new allies in challenging the use of water to exert political control over others? – What are the limitations of the UN Convention on Transboundary Watercourses and other agreements governing shared rivers? Can they be made more effective as tools for challenging hydrohegemony? – What insights can be drawn from historical and current efforts by riverine communities to evolve basinwide collaborative decision-making processes? Where have succeeded and where have they failed; and why? Are regional water parliaments a way forward? at the local, community level. Notes on the Author: Anna Bachmann is the founder and advisor of Waterkeepers Iraq. She spent years in Iraq working on environmental and water issues with Nature Iraq. Today she works as an environmental health specialist in the United States.